I don't like nuclear weapons, but for all the outrage regarding North Korea's nuclear explosion, nobody seems to have noticed that this week the U.S. celebrated the opening of the $3.5 billion National Ignition Facility. The New York Times described project without mentioning its military purpose, except quoting the project director who "compared the project to feats like going to the Moon, building the atom bomb and inventing the airplane." The NIF is supposed to simulate weapons tests without having to do anything as crude as exploding a bomb underground. Presumably North Korea should be condemned for being too poor to produce this cathedral of death near Berkeley, California. p.s. I know that the authorities also wish NIF to create fusion power, but I doubt that it would have funding without its military "benefits." During the Vietnam War, a U.S. soldier seems to have anticipated the spirit of the current economic policy, explaining: "we had to destroy the village in order to save it." The difference today is that while the government destroys villages of the working classes, it is devoting enormous to improve the castles of the rich. Anyone can see the care and feeding of bankers and financiers, while treating much of the rest of the economy with an iron fist. The problem is compounded because alongside the federal stimulus, funding for state and local government is falling off the cliff, in effect, neutralizing much of the stimulus. This contradiction in economic policy is nothing new. A half century ago, E. Cary Brown showed him austerity in state and local governments undid much of the New Deal. Brown, E. Cary. 1956. "Fiscal Policy in the 'Thirties: A Reappraisal." The American Economic Review, Vol. 46, no. 5 (December): pp. 863-66. Nowhere is that policy divergence clearer than in California. A Republican minority blocks all tax increases. The budget deficit seems to increase by a few billions every few weeks. The answer is to eliminate welfare, slash payment to home healthcare workers, and decimate education. I have been looking at papers by Greg Duncan showing the devastating effect of child poverty on children's productive capacity as they mature. In my forthcoming book, The Invisible Handcuffs, I discuss literature that compares the consequences of child poverty on brain development, an effect that resembles the impact of a stroke. Conservatives worry about future tax costs, but what if the losses in the capacity to pay costs exceeds the presumed future burdens of public debt. Foreign owned global corporations account for 60% of Chinese exports to the US. Did you know this? How many people understand that this means that non-Chinese corporations are responsible for the trade imbalance between the US and China. Not Barry Eichengreen who holds the title of the George C. Pardee and Helen N. Pardee Professor of Economics and Political Science at the University of California, Berkeley, where he has taught since 1987., . He says that "Whether [or not] there is a permanent reduction in global imbalances will depend mainly on decisions taken outside the US, specifically in countries like China." Well, how can that be? If China, itself, is not responsible for the great outflow of goods to the US? Not economist Mark Thoma at Economist's View. Nor any other people who have posted comments to the Eichengreen article he linked there. As for the economists, how could they not know the pivotal role of western global corporations in world trade? What should the general public expect from this professional body? Or is this just another exercise in 'preferred nomenclature' suited to U.S. interests? Much akin to the language used by the former Reagan administration. Terms were employed to create the reality which that aggessive administration wanted. The frightening thing is that all subsequent US administrations, including the present Obama-led one, are following this same atrocious template. How important is it to get the facts of world trade right? Is trade between subsidiaries of the same transnational corporations trade at all? Think about it. Because the achievement of clarity on this topic may be, in my humble opinion, a key way to avoid a global nuclear conflict! (The current Chinese military build-up is another story). "The contemplation of things as they are, without substitution or imposture, without error and confusion, is in itself a nobler thing than a whole harvest of invention." What does it mean to be 'slightly left of centre' today? Today, I noticed that Angry Bear's website promises "slightly left of center economic commentary on news, politics, and the economy." What does such a claim mean? Do the writers there aspire to only a slight tweaking of our economic system? Are their words a prayer for business as usual, but with social security payments and a public medical system thrown in? Tell me how will 'slightly left' folks address a new world of dramatic and abrupt climate change? Will the 'slightly left' sit comfortably with the astounding rise of the planetary enterprise of giant corporate conglomerates? Mao’s dictum was that political power grows out of the barrel of a gun and the fact that corporate power and acquisition has done just that seems to shock no one. C Wright Mills wrote that to be a member of the Right was to "celebrate society as it is, a going concern." A going concern?? How many more moments will it be possible to pretend that our world can sustain uncontrolled exploitation? Business people today are thriving in a legal framework that allows them to function without conscience. That means that they kill 600 year old giant rainforest trees on the North West Coast of Tasmania and they don’t care what happens. They change the course of a river, and they don’t care. It means large and small business are free to aerial spray the most dangerous chemicals over millions of people with decades of ongoing social protest still having no real effect. To be Left, says Mills, is to provide "structural criticism and reportage and theories of society". But in this extraordinary time of history those small number of excessively rich and powerful people running the levers of our society are now presenting an apocalyptic near-future. How free should we be to tone down criticism today. How fair and reasonable is it to be "slightly Left"? C Wright Mills essay 'The New Left' Page 253 in 'Power Politics and People'. Some save and intertemporally optimize their consumption plans, while others live paycheck to paycheck, spending their entire income as soon as it's received … Apparently, the new Supreme Court nominee Sonia Sotomayor is an example of the latter. The Washington Post reports that the 54-year-old Sotomayer has a $179,500 yearly salary but “On her financial disclosure report for 2007, she said her only financial holdings were a Citibank checking and savings account, worth $50,000 to $115,000 combined. During the previous four years, the money in the accounts at some points was listed as low as $30,000.” My grandmother would have been shocked and appalled to see someone who makes so much save so little. any day she wants to she could walk out of her current job and into a partnership at a law firm in Manhattan or DC and get paid (guessing again) maybe $2 million a year, with the potential for a lot more. In short, when you take Sotomayor's human capital and circumstances into account, there is nothing wrong with her balance sheet. Sure, she could have another $500,000 tucked away, and that would be nice. But why should she? She has no dependents, except maybe her mother, but her brother is a doctor who, let us assume, is doing well. She has a guaranteed job for life with very generous retirement and health benefits, and any day she decides she wants to be a millionaire, all she has to do is pick up the phone. Sonia Sotomayor has a large defined benefit pension with a current market value of roughly $2.5 million. Sonia Sotomayor has roughly $1 million in equity in her Greeenwich Village condo. Sonia Sotomayor has no descendents to bequeath wealth too. How could someone as smart as Dr. Mankiw miss the obvious possibilities? Maybe he posted this very incomplete analysis as a test for his Harvard students to see if they could articulate the possible explanations of the facts presented in his post in a way that was consistent with the life-cycle model. Kissinger: Their interest is 100 percent political. There was no emphasis at all on the economic side. Even as we arrived at the airport, one of them commented to me, "We are being overwhelmed with your businessmen. In due time we'll do business, but in our own time." Remember, these are men of ideological purity. Chou En-lai joined the Communist Party in France in 1920, long before there was a Chinese Communist Party. This generation didn't fight for 50 years and go on the Long March for trade. Mr Shultz: In Marxist theory, economics is paramount and all else is superstructure. Kissinger: In Marxist practice, politics is paramount. Mr Shultz: Then this is ideological impurity. Kissinger: What I am saying is that they are not interested in trade for trade's sake. I am not saying they are not interested in getting things done. Another thing struck me: When you have read the formalism of old China, it is remarkable to see the absence of hierarchy, for example, in the personal relationship between Chou and his interpreter. There was an easy personal relationship unlike what you would see in any Western official counterpart. Whenever I mentioned chinese history to them, they emphasised what was new. But we were given a special tour of the Forbidden City by their chief archaeologist. Their grace and style did not give you a sense of an enormous break in continuity. At the same time, you get a mystical sense of their revolution as a tremendous emotional experience. Mao is right. It is hard to see how the next generation will feel and act the same way. Mr Peterson: Well,Henry, it's good to have a reason to congratulate you for something other than your presumed sexual exploits. Kissinger: You know I believe in the linkage theory! This week I found myself collecting together some memorabilia from 1974 to provide as a gift to a friend born in that year. I found evidence of the scaffold that swayed our future. The ex-ambassador to Saudi Arabia, James E. Akins… argued [around 1980] that Kissinger acquiesced in the Shah-led oil price hikes beginning in 1974 to provide Iran with the finances to help out ailing Northrup, McDonnell Douglas, General Dynamics, Boeing, Grumman and Litton Industries. In 1974, as oil prices spiralled upward, the Shah launched what, if completed, would have been the most ambitious nuclear program in the Third World: 20 power plants to generate 23,000 megawatts of nuclear capacity by 1994. The Shah and his small industrial elite were in large part motivated by the huge kickbacks to be gained in the negotiations of each reactor contract. The, corporate vendors, on the other side, were reacting to dwindling sales at home and were often backed by substantial export credit offerings from the home governments. ‘Where the Wasteland Ends – Politics and Transcendence in Post Industrial Society’ by Theodore Roszak. ISBN 0571 10581 5. 1972. Faber and Faber Limited, London. The Latin word labor means 'suffering'. We are unwise to forget this origin of the words 'travail' and 'labour'. At least the nobility never forgot their own dignity and the indignity which marked their bondsmen. The aristocratic contempt for work reflected the master's contempt fo the dominated classes; work was the exploitation to which they were condemned for all eternity by the divine decree which had willed them, for impenetrable reasons, to be inferior. Work took its place among the sanctions of Providence as the punishment for poverty, and, because it was the means to a future salvation, such a punishment could take on the attributes of pleasure. Basically, though, work was less important than submission. The bourgeoisie does not dominate, it exploits. It does not need to be master, it prefers to use. Why has nobody seen that the principle of productivity simply replaced the principle of feudal authority? Why has nobody wanted to understand this? * 'The Revolution of Everyday Life' Chapter 5. 'The decline and fall of work'. California needs a two-thirds majority to pass the budget. The hard-line Republicans, who are already doing poorly with the public, looked bad. After long delays, six Republicans offered to support a vicious budget, with modest tax increases on matters that left business and the wealthy unaffected. Republicans required that the Legislature agreed to put a number of very restrictive budget referenda on a special election. This strategy was a brilliant success in tripping up the Democrats, who mostly supported the measure, while both anti-tax forces and most unions opposed it. Besides, if Prop 1A had passed, the state would have to put funds into a rainy day fund, which would have provided a tempting target for future tax cutters. All but one insignificant measure that affected legislators' salaries lost. The media played the election is if it was a resounding victory for anti-tax forces. Even more cuts will hit education and the poor. And the Democrats will have no alternative to offer. The New York Times published a fascinating piece about how AIG managed to get itself regulated as a Savings and Loan by the Office of Thrift Supervision. Guess why? Light as bank regulation is, S&L regulation is even more lenient. And it paid off in the end, no? Cyran, Robert. 2009. "Downfall of a Regulator." New York Times (9 April): p. B2. US financial regulators have spent the last several years in a race to impotence. The clear winner of this chase to the bottom is the Office of Thrift Supervision (OTS), the agency that served as chief financial regulator to a motley crew of credit crunch losers, including Countrywide, Washington Mutual, IndyMac and American International Group. Shuttering OTS would be a good first prize. Other regulators haven't exactly covered themselves with glory. In sheer numbers, more small state-chartered banks regulated by the Federal Deposit Insurance Corporation have failed. In size, only the government's determination that Citigroup was too big to fail and must be bailed out prevented the Comptroller of the Currency from winning the gold medal for incompetent regulation. But the OTS exhibited the worst symptoms of regulatory capture -- that's to say taking the side of the industry it regulates instead of the public. Some signs are trivial but telling. It called institutions under its oversight "customers". Others are extraordinary. It allowed multiple thrifts, among them failed IndyMac, to backdate capital infusions so that earlier quarterly financial statements looked healthier than they would have done. Without this action, IndyMac probably would have closed its doors sooner, possibly reducing associated losses to FDIC and depositors -- the bleeding usually increases as undercapitalised financial institutions stagger on. Scott Polakoff was replaced as acting head of OTS and put on leave at the end of March while the backdating matter is being investigated. The reasons for this regulatory version of Stockholm Syndrome are multiple. The minimal number of bank failures in the middle of the decade bred widespread complacency among all financial regulators. The Bush administration tended to sympathise with the idea that markets regulate better than federal agencies. And the growth of unregulated mortgage brokers and other non-bank financial companies made even OTS oversight look stringent by comparison. But OTS funding also probably played a key role in its failures. The agency's budget comes almost entirely from fees levied on the thrifts it regulates. Fees are based upon asset size. This structure gives OTS, or indeed any regulator, a potential incentive to first try and lure financial institutions into becoming thrifts and then look the other way if they enlarge their asset base through questionable lending. These conflicts of interest were worsened by financial consolidation. A handful of institutions accounted for much of OTS's budget -- Washington Mutual, for example, provided about 12% of the agency's operating funds, according to Patricia McCoy, a professor at the University of Connecticut School of Law who has testified to the US Senate on the matter. OTS rejects the notion that it encouraged or even temporarily benefited from regulatory arbitrage. But this is hard to square with history. Countrywide switched to the OTS in early 2007, a move that did consolidate the company's oversight but was also widely attributed to the attractions of the agency's perceived lighter touch. That switch meant four of the five biggest issuers of option ARMs - a particularly virulent form of mortgage loan that former OTS head John Reich had praised in speeches - were under OTS supervision. The fallout from the housing downturn forced Countrywide into Bank of America's arms. The other three -- IndyMac, Downey Financial and Washington Mutual -- all failed. So what can be done to prevent this happening again? Funding regulatory agencies at least partly through Congressional appropriations rather than user fees might help cut the ties between industry and regulators. It's no panacea, though. The predecessor to OTS was abolished precisely because lawmakers leaned on regulators -- and threatened to cut their budgets -- to stop an investigation into Lincoln Savings and Loan, the thrift controlled by Charles Keating which subsequently went bankrupt. But at least the distance between regulator and regulated is greater when funds come from Congress. A better idea is regulatory consolidation on the federal level, with broad new statutes that apply to surviving regulators. For example, underwriting should be based on consumers' ability to repay. Common lending standards on sensible principles would limit the wiggle room in which toxic lending products thrive. And reducing the number of agencies should reduce regulatory arbitrage. After all, Washington bureaucrats gain prestige and influence by winning turf wars, not unlike the private sector companies they oversee. Minimise the soil that can be fought over, and financial institutions have less ability to play one official off against another. 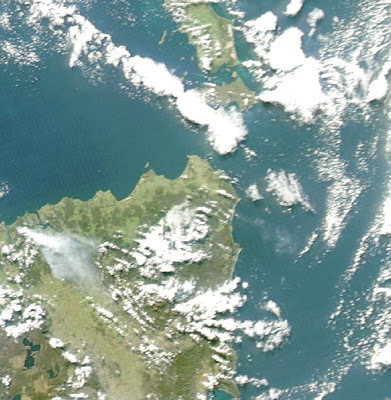 On the right see the satellite image of smoke from one of the many annual industrial forestry burns in Tasmania, Australia. This one is over North Eastern Tasmania where the pollution again caused people to evacuate their homes. [We must] "stop seeking and celebrating dinky achievements" because "nothing that we are doing, nor even seriously contemplating, comes anywhere near such a massive transformation [as is necessary], yet every actor on the political stage ... downplays the terrible realities and trumpets small-scale solutions wrapped in upbeat rhetoric ... We are racing toward the end of the world and have no plan of escape, but it is considered impolite to acknowledge that fact in public." --- David Spratt, author of Climate Code Red. "We are on our way to a destabilisation of the world climate that has advanced much further than most people or their governments realise", so "our survival would very much depend on how well we were able to draw down carbon dioxide to 280 parts per million", compared to the present level of close to 390ppm." David Spratt informs the reader that Zero Carbon Britain released an alternative energy strategy in 2007 that found "in 20 years, the UK could produce 100 per cent of electricity without the use of fossil fuels or nuclear power, while also almost tripling electricity supply, and using it to power most heating and transport systems." However, the report refers to carbon capture technology that is not yet proven. It also promotes the idea of a huge expansion of forestry and biomass crops over agricultural land. And here's another major cause for concern about this report. The science behind forests as carbon sinks is very dubious. See 'Pieces of Mind'. Political Aspects of Full Employment V, 2. 'Full employment capitalism' will, of course, have to develop new social and political institutions which will reflect the increased power of the working class. If capitalism can adjust itself to full employment, a fundamental reform will have been incorporated in it. If not, it will show itself an outmoded system which must be scrapped. But perhaps the fight for full employment may lead to fascism? Perhaps capitalism will adjust itself to full employment in this way? This seems extremely unlikely. Fascism sprang up in Germany against a background of tremendous unemployment, and maintained itself in power through securing full employment while capitalist democracy failed to do so. The fight of the progressive forces for all employment is at the same time a way of preventing the recurrence of fascism. am preparing to give two lectures the economics of crisis and crisis of economics during my trip to China. I only have the introduction so far. I would much appreciate any comments. I just got this from Stewart Brand, who organizes lectures at San Francisco's Fort Mason. Romer is suggesting that less developed countries contract with capitalist nations to set up Hong Kong's for them. What about the alternative, having capitalist nations let us set up little socialist republics to demonstrate an alternative system. This talk was the first public launch of an idea that Romer has been working on for two years. His economic theory of history explains phenomena such as the constant improvement of the human standard of living by looking primarily at just two forms of innovative ideas: technology and rules. Technologies rearrange materials with ingenious recipes and formulas. More people create more technologies, which in turn generates more people. In recent decades technology has enabled the "demographic transition" which lowers birthrates and raises income per person even higher as population levels off. Rules structure the interactions between people. As population density increased, the idea of ownership became an important rule. A supporting rule for managing violations replaced the old idea of deadly vengeance with awarding damages instead: simply shifting value replaced destroying value. For the idea of open science, recognition replaced ownership as the main event, which means that whoever publishes first is most rewarded, and that accelerates science. Rules can amplify or stifle technological progress. China was the world leader in inventing new technologies until about a thousand years ago, when centralized dynastic rules slowed innovation almost to a stop. Romer notes that business keeps evolving as new companies introduce new rule sets. The good ideas are copied, and workers migrate from failing companies to the new and old ones where the new rules are working well. The same goes for countries. Starting about 1970, China took some of the effective rules of Hong Kong (which was managed from afar by England) and set up four special economic zones along the coast operating as imitation Hong Kongs. They worked so well that China rolled out the scheme for the whole country, and its Gross Domestic Product took off. "Hong Kong was the most successful economic development program in history." Paul Romer proposes that developing countries could invite instant Hong Kongs---new cities in new locations run by experienced governments such as Canada or Finland. They would enrich the country where they are built as special economic zones while also rewarding the distant government that makes the investment of building the new city state and installing a set of fair and productive rules. Over time, as with Hong Kong, the new city is turned over to the host country. The idea is getting some traction in the developing world. This summer Romer is going public with a Bridge Cities Institute website for further exploration and eventual application of the idea. One miracle of cities is that they sometimes renew themselves brilliantly. This could be a whole new form of that. Political Aspects of Full Employment V, 1. Should a progressive be satisfied with a regime of the political business cycle as described in the preceding section? I think he should oppose it on two grounds: (i) that it does not assure lasting full employment; (ii) that government intervention is tied to public investment and does not embrace subsidizing consumption. What the masses now ask for is not the mitigation of slumps but their total abolition. Nor should the resulting fuller utilization of resources be applied to unwanted public investment merely in order to provide work. The government spending programme should be devoted to public investment only to the extent to which such investment is actually needed. The rest of government spending necessary to maintain full employment should be used to subsidize consumption (through family allowances, old-age pensions, reduction in indirect taxation, and subsidizing necessities). Opponents of such government spending say that the government will then have nothing to show for their money. The reply is that the counterpart of this spending will be the higher standard of living of the masses. Is not this the purpose of all economic activity? The global warming crisis is far worse than officially indicated says David Spratt the author of 'Climate Code Red' and Ted Nordhaus author of 'The Emerging Climate Consesnsus' and 'The Death of Environmentalism'. David Spratt: "We face a climate EMERGENCY. At times of emergency you don't put a price in the market. 2 degrees celsius is enough for 5-10 metres of sea level rise. Enough to melt Greenland." Ted Nordhause from the Breakthrough Institute in California agrees. "We need to directly invest in employing the technologies we need. The cap and trade is indirect. We are not going to achieve this by making dirty sources of energy more expensive. We need to make clean energy cheap." Nordhaus added that we need massive public investment in research and deployment; massive new infrastructure. Public monies should be employed due to the existence of what is termed the "Gordian Knot' - Because of the huge price gap between dirty and clean energy, if you raise the price of fossil fuels you get almost an immediate public reaction. . But if you don't raise the price enough you don't get the public converting to clean energy. Norhaus says that solar thermal technology will be competitive with coal by 2013 and he claims that this development has been actively suppressed by Government. David Spratt: "We can come up with money to save the banking system, but will we come up with money to save the planet?" "I do a lot of opinion research work. What Americans want is long, large investments in the health of the US economy, for example renewable technologies." Thirty to fifty percent of GDP was spent on the Second World War. Why not employ a similar percent on this climate emergency? Historically the environment movement has focussed on regulating and restricting. This new requirement is to build a fundamentally new economy, says Nordhaus. We cannot leave aside our own personal responsibilities in terms of growing food, using bicycles, conserving energy in the home. The research I've done confirms Spratt's and Nordhaus' warnings. See references below. Global warming: has the meltdown has begun? GLOBAL WARMING Reason for Alarm? Arctic Sea Ice Gone in Summer Within Five Years? Once he had decided to major in English, “since it sounded like something I might already know,” he learned to enjoy tossing the vocabulary of deconstructionism back at his teachers. He brought his SAT whiz’s skill to the deployment of “liminal,” “valuational,” “heuristic” and “praxis.” He felt empowered to attack a Western canon that he had never really read, skipping “straight from ignorance to revisionism.” These academic madeleines are as nostalgia inducing as the well-chosen pop culture references (the “Moosewood Cookbook”: “a best-selling guide to taste-free dining”) found throughout the book. I guess the irony is lost on Maslin; by appealing to her prejudices, Kirn can also pretend to know something about cooking. I have two words for Maslin, and for Kirn as well if he now pretends his days of pretending are behind him: gypsy soup. (i) Henry "Kissinger was the "most frequent visitor" to the George W. Bush White House as an unofficial political advisor on Israel and the Middle East—including the invasion and occupation of Iraq." (The Australian Labor Prime Minister, Kevin Rudd, continues to meet regularly with him). (iv) A recent New York Times article, that describes the emergence of the above huge trade imbalance, fails to point out the very significant role of US and other transnational corporations in this global dilemma. With one single company representing 10% of trade between the US and China this is a very significant omission. Many Australians are alarmed with the far right leanings of the new Labor Government under Kevin Rudd. Both the current Rudd and the former Howard administrations have used billions of dollars of taxpayer funds to transfer vast amounts of land to a selected handful of transnational corporations and to subsidise their corporate agribusiness operations. The latter include native forest destruction of a vast scale.) Now a company called PrimeAg whose Deputy Chairman is Roger Corbett (see below) is set to buy up these failed and heavily-subsidised landholders. One of these is Futuris. It owns a major stake in Forest Enterprises, my tormenting neighbour! Futuris has grabbed 1.4% of Australia's land mass. This could represent around 10% of Australia's agricultural land! Wal-Mart's 'China Price' By Joshua Holland, AlterNet. Posted November 7, 2005. 1. The ability to achieve carbon targets depends on the coverage of the program. W-M starts with limited coverage (few sectors capped) and then sets up a protracted battle for extending cap-and-trade to more sectors in the years to come. In spite of timetables written into the bill, you can be sure that each extension will be fought over; there will always be a reason (amplified by lobbying largesse) to postpone bringing in new parts of the economy. 2. Once you have agreed to a sectoral approach, and once you start handing out carbon permits to everyone on the receiving line, you get to haggle over each sector’s carbon budget. There is always a reason to make your sector’s emission reduction target a little lower than the next guy’s. 3. Contrary to what Krugman claims, verifying the actual carbon emissions of each sector is herculean and quite likely to fail. 4. The experience of the European Trading System, which W-M emulates, confirms all these predictions; it has been a disaster. Fixing it, and fixing a future system along the same lines in the US, will mean scrapping it and starting over. The irony is that there is a much simpler, much more effective alternative: put a limit on the amount of carbon fuels available to the economy by requiring a permit to extract or import them. Coverage is complete, there is a single, economy-wide target, and verification is a snap. There is little opportunity under such a system for businesses to offer or politicians to demand favors for loopholes and special-interest tweaks. Maybe that’s why it’s not on the table. Political Aspects of Full Employment IV, 3. Even those who advocate stimulating private investment to counteract the slump frequently do not rely on it exclusively, but envisage that it should be associated with public investment. It looks at present as if business leaders and their experts (at least some of them) would tend to accept as a pis aller public investment financed by borrowing as a means of alleviating slumps. They seem, however, still to be consistently opposed to creating employment by subsidizing consumption and to maintaining full employment. In this situation a powerful alliance is likely to be formed between big business and rentier interests, and they would probably find more than one economist to declare that the situation was manifestly unsound. The pressure of all these forces, and in particular of big business-as a rule influential in government departments-would most probably induce the government to return to the orthodox policy of cutting down the budget deficit. A slump would follow in which government spending policy would again come into its own. This pattern of a political business cycle is not entirely conjectural; something very similar happened in the USA in 1937-8. The breakdown of the boom in the second half of 1937 was actually due to the drastic reduction of the budget deficit. On the other hand, in the acute slump that followed the government promptly reverted to a spending policy. The regime of the political business cycle would be an artificial restoration of the position as it existed in nineteenth-century capitalism. Full employment would be reached only at the top of the boom, but slumps would be relatively mild and short-lived. Political Aspects of Full Employment IV, 2. In current discussions of these problems there emerges time and again the conception of counteracting the slump by stimulating private investment. This may be done by lowering the rate of interest, by the reduction of income tax, or by subsidizing private investment directly in this or another form. That such a scheme should be attractive to business is not surprising. The entrepreneur remains the medium through which the intervention is conducted. If he does not feel confidence in the political situation, he will not be bribed into investment. And the intervention does not involve the government either in 'playing with' (public) investment or 'wasting money' on subsidizing consumption. It may be shown, however, that the stimulation of private investment does not provide an adequate method for preventing mass unemployment. There are two alternatives to be considered here. (i) The rate of interest or income tax (or both) is reduced sharply in the slump and increased in the boom. In this case, both the period and the amplitude of the business cycle will be reduced, but employment not only in the slump but even in the boom may be far from full, i.e. the average unemployment may be considerable, although its fluctuations will be less marked. (ii) The rate of interest or income tax is reduced in a slump but not increased in the subsequent boom. In this case the boom will last longer, but it must end in a new slump: one reduction in the rate of interest or income tax does not, of course, eliminate the forces which cause cyclical fluctuations in a capitalist economy. In the new slump it will be necessary to reduce the rate of interest or income tax again and so on. Thus in the not too remote future, the rate of interest would have to be negative and income tax would have to be replaced by an income subsidy. The same would arise if it were attempted to maintain full employment by stimulating private investment: the rate of interest and income tax would have to be reduced continuously. In addition to this fundamental weakness of combating unemployment by stimulating private investment, there is a practical difficulty. The reaction of the entrepreneurs to the measures described is uncertain. If the downswing is sharp, they may take a very pessimistic view of the future, and the reduction of the rate of interest or income tax may then for a long time have little or no effect upon investment, and thus upon the level of output and employment. Political Aspects of Full Employment IV, 1. What will be the practical outcome of the opposition to a policy of full employment by government spending in a capitalist democracy? We shall try to answer this question on the basis of the analysis of the reasons for this opposition given in section II. We argued there that we may expect the opposition of the leaders of industry on three planes: (i) opposition on principle to government spending based on a budget deficit; (ii) opposition to this spending being directed either towards public investment-which may foreshadow the intrusion of the state into the new spheres of economic activity-or towards subsidizing mass consumption; (iii) opposition to maintaining full employment and not merely preventing deep and prolonged slumps. Now it must be recognized that the stage at which 'business leaders' could afford to be opposed to any kind of government intervention to alleviate a slump is more or less past. Three factors have contributed to this: (i) very full employment during the present war; (ii) development of the economic doctrine of full employment; (iii) partly as a result of these two factors, the slogan 'Unemployment never again' is now deeply rooted in the consciousness of the masses. This position is reflected in the recent pronouncements of the 'captains of industry' and their experts.5 The necessity that 'something must be done in the slump' is agreed; but the fight continues, firstly, as to what should be done in the slump (i.e. what should be the direction of government intervention) and secondly, that it should be done only in the slump (i.e. merely to alleviate slumps rather than to secure permanent full employment). “I’ll let you guys discern what inflection point, what period of day, that all changed,” Mr. Gibbs continued. If you remember your calculus, you’ll probably think, as I did, this guy is confusing first and second derivatives. But the larger point, I suspect, is that we are going through a long period in which, as more of the population acquires basic technical training, math and science language is going to enter the general discourse. This means that people without this training will be using the tech-talk too, and often getting it wrong. The division of society between people who have these skills and those who don’t will become more obvious. It becomes another form of “distinction”, in Bourdieu’s sense. What does this have to do with the issue of military commissions and Guantanamo detainees? Nothing – it’s orthogonal. Political Aspects of Full Employment III, 2. The fact that armaments are the backbone of the policy of fascist full employment has a profound influence upon that policy's economic character. Large-scale armaments are inseparable from the expansion of the armed forces and the preparation of plans for a war of conquest. They also induce competitive rearmament of other countries. This causes the main aim of spending to shift gradually from full employment to securing the maximum effect of rearmament. As a result, employment becomes 'over-full'. not only is unemployment abolished, but an acute scarcity of labour prevails. Bottlenecks arise in every sphere, and these must be dealt with by the creation of a number of controls. Such an economy has many features of a planned economy, and is sometimes compared, rather ignorantly, with socialism. However, this type of planning is bound to appear whenever an economy sets itself a certain high target of production in a particular sphere, when it becomes a target economy of which the armament economy is a special case. An armament economy involves in particular the curtailment of consumption as compared with that which it could have been under full employment. The fascist system starts from the overcoming of unemployment, develops into an armament economy of scarcity, and ends inevitably in war. My former student, Ryan Libre, snuck into Burma to meet with the Kachin Independence Army. He is one of my favorite students, even though he has a long-standing incomplete in one of my classes. Our local weekly has a short story about his work. Media coverage has been predictably confused about the compromises loaded onto the Waxman-Markey climate change bill. The headlines obsess on targets for 2020 (relaxed) and 2050 (maintained), as if decisions made today somehow preempt our choices over the next 10 or 40 years. They don't, of course, and reasonable people should pay no attention to them. Targets for the first year or two matter; beyond that it’s all rhetoric. So forget the targets. What really matters is the architecture. If we put the wrong system into place, our job will only get harder, since it is much more difficult to dismantle and rebuild a regulatory structure than to set one up from scratch — sort of like the difference between brownfield and greenfield. To see this truth in action, just look at the struggle of the EU to get out from under their disastrous European Trading System. So how does Waxman-Markey rate on architecture? It’s a loser. The single biggest flaw, one which is fundamentally not fixable, is the decision to issue permits on an industry-by-industry basis — to cap the uses of carbon fuels rather than their sources. This is an invitation to never-ending bickering over who is allowed to emit how much. Every little tweak of the system — whether to include freight transportation or agriculture (which crops!) — has to be hammered out separately. Reductions are calculated from a baseline, but there are acres of wriggle room about how to measure who emitted how much in the base year and therefore how much should be reduced tomorrow. Enforcement is complex, expensive and full of loopholes. Only lawyers (and politicians with extortionary campaign finance strategies) could love this. There needs to be a single comprehensive cap on the sources, not the uses, of carbon fuels. Require permits for the extraction of these fuels from the ground or importing them from abroad. Limit the number of permits to achieve an emissions target, then leave it to the normal workings of the market to determine which industries will get which share of the stuff. Auctioning the permits is also extremely important, but this is fixable in future iterations if the architecture is right. It is not fixable under Waxman-Markey, because the percentage has to be set for each industry separately, and cranking each one up to 100 is an impossible political task. Mainstream environmental groups are not blind to these problems, but they see them as second-order. Above all, they are soooooo happy that climate deniers are not in command of politics any more. They are fighting yesterday’s battle, to get general agreement on the principle that climate change is caused by people, and people need to do something about it. They like the nice feeling that comes from all of us raising our hands and pledging, scout’s honor, to achieve sustainability by 2050. But they are losing today’s battle to put into place a viable means to get from here to there, and judging from their public statements they don’t even know it. Political Aspects of Full Employment III, 1. One of the important functions of fascism, as typified by the Nazi system, was to remove capitalist objections to full employment. The dislike of government spending policy as such is overcome under fascism by the fact that the state machinery is under the direct control of a partnership of big business with fascism. The necessity for the myth of 'sound finance', which served to prevent the government from offsetting a confidence crisis by spending, is removed. In a democracy, one does not know what the next government will be like. Under fascism there is no next government. The dislike of government spending, whether on public investment or consumption, is overcome by concentrating government expenditure on armaments. Finally, 'discipline in the factories' and 'political stability' under full employment are maintained by the 'new order', which ranges from suppression of the trade unions to the concentration camp. Political pressure replaces the economic pressure of unemployment. Political Aspects of Full Employment II, 4. We have considered the political reasons for the opposition to the policy of creating employment by government spending. But even if this opposition were overcome--as it may well be under the pressure of the masses-the maintenance of full employment would cause social and political changes which would give a new impetus to the opposition of the business leaders. Indeed, under a regime of permanent full employment, the 'sack' would cease to play its role as a 'disciplinary measure. The social position of the boss would be undermined, and the self-assurance and class-consciousness of the working class would grow. Strikes for wage increases and improvements in conditions of work would create political tension. It is true that profits would be higher under a regime of full employment than they are on the average under laissez-faire, and even the rise in wage rates resulting from the stronger bargaining power of the workers is less likely to reduce profits than to increase prices, and thus adversely affects only the rentier interests. But 'discipline in the factories' and 'political stability' are more appreciated than profits by business leaders. Their class instinct tells them that lasting full employment is unsound from their point of view, and that unemployment is an integral part of the 'normal' capitalist system. Social Security in Crisis: Act Now! Like many of you, I am deeply troubled by the latest news about the Social Security trust fund. Until this morning, I was mired in complacent ignorance, soothed by the belief that it would be sufficient to pay all benefits until 2041. Now I know the awful truth: because of the current economic downturn, the fund will be exhausted in 2037, a mere 28 years from now. Unwilling to face reality, my first reaction was denial. Aha! I thought, the prognosticators have overlooked the effects of the Great Boom of 2021-24. This will add almost a decade to the fund’s lifespan and forestall the need for painful reforms. But then I remembered that there will be a terrible slump in the early 30s, and that this would drain the fund once and for all. Fellow citizens, wake up! There is no escaping the inevitable. We must begin to make major sacrifices now, and I mean today, in order to avert this impending debacle. Cut benefits! Raise taxes! This is your last chance to save Social Security! A former Central Intelligence Agency economic analyst has helped to set up a Cayman Island registered partnership to take advantage of what is referred to by the directors and partners as "climate related market drivers" and "vigorous demand" for water in Australia. When I think CIA I tend to think of Henry Kissinger who was the trusted aid of Nelson Rockefeller. It so happens that a related Robert Rockefeller (President of the Property Council of Australia) has been heavily involved in pushing for water market reform in Tasmania for the past decade. The latter Rockefeller has successfully persuaded the State Government to seize the water assets of my local municipality without providing adequate compensation for the ongoing loss of revenue that this action entails. When I think of Henry Kissinger I think of his close admirer - the Prime Minister of Australia, Mr Kevin Rudd. Mr Rudd has a habit of flying over to Washington on a regular basis and having "productive talks" with Mr Kissinger . Speaking of coups, this must be one for the creation of a perfect neoliberal 'market'. Captured buyers - we all have to consume the stuff - and there's no substitute product available. "The absence of alternatives clears the mind marvelously", as Kissinger has said. The price of this water is indexed to inflation. It seems to me that there's nothing like water scarcity and water charges (the latter being a tax on food producers) to cause a general rise in prices within the economy. Higher prices, higher water charges --> higher prices --> higher water charges. And round and round it goes. Well, what can one expect these days. After all, quoting Henry K again: "foreign policy is not missionary work." Graham Dooley, Chairman of the Adelaide registered 'Summit Water Holdings' which is a subsidiary of Summit Water Development (part of Summit Global Management Incorporated). As per the article: 'US enters Aussie Market - Yanks Raid Water'. Weekly Times, 1st April 2009. Pages 1,4, 15, 16. And Rudd met Kissinger again in last week of March this year. Political Aspects of Full Employment II, 3. The dislike of business leaders for a government spending policy grows even more acute when they come to consider the objects on which the money would be spent: public investment and subsidizing mass consumption. One might therefore expect business leaders and their experts to be more in favour of subsidising mass consumption (by means of family allowances, subsidies to keep down the prices of necessities, etc.) than of public investment; for by subsidizing consumption the government would not be embarking on any sort of enterprise. In practice, however, this is not the case. Indeed, subsidizing mass consumption is much more violently opposed by these experts than public investment. For here a moral principle of the highest importance is at stake. The fundamentals of capitalist ethics require that 'you shall earn your bread in sweat'-unless you happen to have private means. [*]It should be noted here that investment in a nationalized industry can contribute to the solution of the problem of unemployment only if it is undertaken on principles different from those of private enterprise. The government must be satisfied with a lower net rate of return than private enterprise, or it must deliberately time its investment so as to mitigate slumps. Political Aspects of Full Employment II, 2. We shall deal first with the reluctance of the 'captains of industry' to accept government intervention in the matter of employment. Every widening of state activity is looked upon by business with suspicion, but the creation of employment by government spending has a special aspect which makes the opposition particularly intense. Under a laissez-faire system the level of employment depends to a great extent on the so-called state of confidence. If this deteriorates, private investment declines, which results in a fall of output and employment (both directly and through the secondary effect of the fall in incomes upon consumption and investment). This gives the capitalists a powerful indirect control over government policy: everything which may shake the state of confidence must be carefully avoided because it would cause an economic crisis. But once the government learns the trick of increasing employment by its own purchases, this powerful controlling device loses its effectiveness. Hence budget deficits necessary to carry out government intervention must be regarded as perilous. The social function of the doctrine of 'sound finance' is to make the level of employment dependent on the state of confidence. This is exactly right. The reason we don't torture is not or shouldn't be that it doesn't yield reliable information, or that it protects our own captive soldiers in the future, whether or not these things are in fact true. Cheney's claim that the former is false, even if it were so, is irrelevant. The logic of our moral reasoning is not a consequentialist logic. Obama has spelled out this non-consequentialist logic explicitly. The reason not to torture, he has said, is that it corrupts our character. There has been a lot of discussion of this recent article by Barry Eichengreen in The National Interest. In a nutshell, Eichengreen’s argument is we should not blame economic theory for the failure to anticipate and avoid the financial crisis. Theory had the tools—agency theory, asymmetric information, behavioral economics—to do the job. The problem was that some academic economists were seduced by extramural income opportunities to ignore these subfields, while the others followed along to avoid the costs of nonconformism. Fortunately, he concludes, economics is becoming more empirical, so embarrassing episodes like this will be less common in the future. Some parts of this are unarguable. There were important theoretical developments during the past 20 years that can be drawn on to understand what went wrong. To a considerable extent, the economics profession has been suborned; it has bent itself, heliotropically, to the sources of its enrichment. Nevertheless, I would take issue with Eichengreen on two main points. First, economic theory, taken as a whole, is culpable. The core problem is that each theoretical departure, whether it is a knotty agency problem or a behavioral kink, is inserted into an otherwise pristine general equilibrium framework. The only way you can get an article published in a mainstream economics journal (and therefore reproduce the conditions of your existence as an academic economist) is to present your departure piecemeal, showing that it exerts its effects even in an otherwise pristine universe. According to the standards that rule the profession, a GE model with one twist is theory’s version of the controlled experiment. This is why the picture Eichengreen paints for us, in which multiple unorthodox insights come together and interact synergistically, is never seen in a peer-reviewed economics journal. As a result, even though every organ of 1960's-era orthodoxy is mortally wounded, the entire body strides vigorously forward. That is a prime reason why, despite the labors of so many clever and right-thinking economic theorists, we are in this mess. Second, the shift toward empiricism is not an unalloyed gain. Yes, much of this work is refreshingly open-minded, allowing the data to lead. An honest tally of the published literature, however, particularly in the top journals, will show that a majority of quantitative articles are concerned to calibrate existing theoretical models. Unless a model is so out of step or inflexible that it cannot be calibrated at all, it passes the empiricist’s “test”. Economics, as I have argued before here and elsewhere, has no culture of what in real sciences is known as a critical test, a confrontation with data that can be survived only if the hypothesis in question is highly likely to be correct. In other words, empirical work in economics, whatever sophisticated estimators it employs and stringent p-values it seeks, has little to do with the minimization of Type I error, properly understood. For this reason, bad theory (like the mind-numbing onslaught of DSGE models in macro) prosper even in the midst of the “empirical turn”. With enough tweaking, I can calibrate an equilibrium model of the US economy as of 2006, and again as of 2009. It won’t be exactly the same model, but it will use a standard set of baseline assumptions, so who cares? The bottom line is that economics in both its theoretical and empirical modes is implicated in the current debacle. Making the funding of economists more transparent would help, and attention should be given to the institutional structures that favor conformism within the profession, but economics itself needs to be reformed. May BLS Non-farm payroll employment decline: -775,000 to -835,000 jobs lost. One of the things I noticed mucking around with the BLS birth/death model is that the Business Employment Dynamics data upon which the model is based doesn't quite seasonally adjust. That is to say the 'seasonally-adjusted' series of business openings and closings still displays a noticeable seasonal fluctuation. Thus when the imputed birth/death adjustment is added back into raw employment data and then seasonally-adjusted, the birth/death adjustment might be partly undoing the seasonal adjustment of the employment totals. Another thing I noticed is that seasonally unadjusted January to June employment numbers consistently display a steady slope, with the seasonally-adjusted employment figures intersecting that line at April. So far this year, the January to April segment of that line has been flat, with a minor dip down in February and March followed by a small bounce in April. That small bounce might reflect the 62,000 census workers plus the residual unadjusted seasonal variation from the birth/death model. Assuming that the flat-line slope of the unadjusted employment figure follows the usual pattern and applying a rough seasonal adjustment formula to the result produces a trend projection loss of between 775,000 and 835,000 jobs in May, depending on whether one discounts the one-time-only 2010 census jobs. The reported number could be less because of upward revision of the April job loss figure. Just before President Obama visited here on April 16, in contrast, the Mexican Senate approved a request by the government of President Felipe Calderón to allow the Mexican Navy to participate, for the first time, in annual exercises with the United States and other nearby countries. During Mr. Obama’s trip, Mr. Calderón even briefly addressed Mr. Obama in English in public at the Mexican White House; that was something that Mexican presidents always avoided in my day, for reasons of sovereignty, self-image and the very complicated history of American-Mexican relations. None of this suggests that Mexico has become a model state. Political Aspects of Full Employment II, 1. The above is a very crude and incomplete statement of the economic doctrine of full employment. But it is, I think, sufficient to acquaint the reader with the essence of the doctrine and so enable him to follow the subsequent discussion of the political problems involved in the achievement of full employment. In should be first stated that, although most economists are now agreed that full employment may be achieved by government spending, this was by no means the case even in the recent past. Among the opposers of this doctrine there were (and still are) prominent so-called 'economic experts' closely connected with banking and industry. This suggests that there is a political background in the opposition to the full employment doctrine, even though the arguments advanced are economic. That is not to say that people who advance them do not believe in their economics, poor though this is. But obstinate ignorance is usually a manifestation of underlying political motives. There are, however, even more direct indications that a first-class political issue is at stake here. in the great depression in the 1930s, big business consistently opposed experiments for increasing employment by government spending in all countries, except Nazi Germany. This was to be clearly seen in the USA (opposition to the New Deal), in France (the Blum experiment), and in Germany before Hitler. The attitude is not easy to explain. Clearly, higher output and employment benefit not only workers but entrepreneurs as well, because the latter's profits rise. And the policy of full employment outlined above does not encroach upon profits because it does not involve any additional taxation. The entrepreneurs in the slump are longing for a boom; why do they not gladly accept the synthetic boom which the government is able to offer them? It is this difficult and fascinating question with which we intend to deal in this article. The reasons for the opposition of the 'industrial leaders' to full employment achieved by government spending may be subdivided into three categories: (i) dislike of government interference in the problem of employment as such; (ii) dislike of the direction of government spending (public investment and subsidizing consumption); (iii) dislike of the social and political changes resulting from the maintenance of full employment. We shall examine each of these three categories of objections to the government expansion policy in detail. I am writing to offer a comment on scientific integrity. As we know, it is important that those whose work is used to provide a scientific basis for policy decisions reveal the sources of their funding so as to avoid conflicts of interest or undisclosed potential bias. This stipulation has made gradual progress in the medical sciences in particular -- something for which we should all be grateful. Unfortunately, in my own field of economics no one makes or enforces such a rule. Economic analysis often plays a central role in decision-making, and economists are often funded by interested parties, but disclosure is nonexistent. It is unlikely that the economics profession will take the lead in remedying this situation, so we have to look to our clients. If OSTP would take a clear stand on this matter it would improve the credibility of analysis entering the regulatory process and would also have a salutary effect on the profession itself. UPDATE: The rules for biomedical researchers may be tightening. Why can't we do this for economists? Dean Baker points out that among the discrepancies in the "better than expected" April employment number from BLS is the fact that the "birth/death" adjustment for April 2009 is 50,000 jobs higher than it was for April 2008 -- an unlikely eventuality. To account for this net birth/death portion of total employment, BLS uses an estimation procedure with two components: the first component excludes employment losses from business deaths from sample-based estimation in order to offset the missing employment gains from business births. This is incorporated into the sample-based estimate procedure by simply not reflecting sample units going out of business, but imputing to them the same trend as the other firms in the sample. This step accounts for most of the net birth/death employment. So, for example, if 227,000 jobs were lost at firms that went out of business in April but other firms shed only about .5% of their employees that month, then the BLS pretends (roughly) that new firms created 226,000 new jobs (with some minor adjustment to take into account the historical trend over the last five years). This actually might make some kind of sense in normal times, because the BLS survey systematically misses employment at firms that are starting-up. But there's a recession on. And a credit crunch. More egregious than the questionable BLS imputation is the tendency in media commentary to interpret the result as some kind of turning point. 539,000 job losses is huge, but it's an improvement over the 699,000 jobs lost in March or the 681,000 in February... right? No. It's a further deterioration of the job market at a decelerating rate. But wait, minus the birth/death imputation the trend is: February 815,000, March 813,000, April 765,000 . And, net of the extraordinary, one-time-only hiring of 62,000 people for the 2010 census, the April figure would be 827,000. It's also worth mentioning that these losses are from a progressively shrinking base, so a given number of job losses represents a larger percentage loss. Discounting for statistical anomalies, the trend appears to be one of accelerating job losses. The best that can be said for the April situation is that the acceleration of job loss is within the margin of error. Whoop-de-doo! Are AIG employees using bailout money to pay selected off counterparties in order to get jobs with them? Political Aspects of Full Employment I, 3. [*]Another problem of a more technical nature is that of the national debt. If full employment is maintained by government spending financed by borrowing, the national debt will continuously increase. This need not, however, involve any disturbances in output and employment, if interest on the debt is financed by an annual capital tax. The current income, after payment of capital tax, of some capitalists will be lower and of some higher than if the national debt had not increased, but their aggregate income will remain unaltered and their aggregate consumption will not be likely to change significantly. Further, the inducement to invest in fixed capital is not affected by a capital tax because it is paid on any type of wealth. Whether an amount is held in cash or government securities or invested in building a factory, the same capital tax is paid on it and thus the comparative advantage is unchanged. And if investment is financed by loans it is clearly not affected by a capital tax because if does not mean an increase in wealth of the investing entrepreneur. Thus neither capitalist consumption nor investment is affected by the rise in the national debt if interest on it is financed by an annual capital tax. Australia and the UK blocked reforms in the global forest industry this week. At the third design meeting of the World Bank Forest Investment Program (FIP) that took place in Washington in the last few days the UK took the lead in blocking consensus for safeguard criterion on the “integrity of natural forests”. The UK supported the conversion of native forests to plantations as well as the destructive process of clearfelling. The UK insisted upon the definition of ‘forest’ as one that includes industrial tree monocultures. If the UK successfully gets its way on the latter point “the replacement of the Amazon (rainforest) by oil palm plantations, as currently being planned by the Brazilian government, would not be regarded ' deforestation" under these definitions." PERIMETER INSTITUTE RECORDED SEMINAR ARCHIVE is where one can find most of the lectures that were given May 1-3 at the conference on "The Economic Crisis and its Implications for the Science of Economics" at the Perimeter Institute for Theoretical Physics. The following ones can be accessed there. Eric Weinstein, "A science less dismal: welcome to the Economic Manhattan Project"
Nouriel Roubini, "Interpreting the failure to predict financial crises and recession"
Emanuel Derman, "Scientists, scienster, anti-scientists and economists"
Andrew Lo, "The adaptive market hypothesis and financial crisis"
Leigh Tesfatsion, "Introduction to agent based models"
Alexander Outkin, Mike Brown, Jim Herriot, "A look at some models"
Samuel Vasquez, Kelly Rose (others listed, but not speaking), "Group work"
Political Aspects of Full Employment I, 2. Do We Need an "Economic Manhattan Project"? Political Aspects of Full Employment I, 1.